This video was part of the Brent Walker series that was broadcast in the United States on PBS. It is one of the more fascinating entries in the series, with some intriguing innovations as well as a few ideas that fall flat. The high point is surely the ghost scene, with deceased Murgatroyds enjoying tea and biscuits while they harass Sir Ruthven. The ghosts do not all revive from portraits—a few are memorialized as busts or statues, a clever twist that I've seen copied in a couple of stage productions. The first act is generally less appealing. A particularly irritating bit occurs in "When sailing o'er life's ocean wide," in which the picture suddenly cuts to the three singers apparently floating in a barrel in the middle of the ocean. This is video technology at its least appealing, where the director is calling attention to his own cleverness instead of just telling the story. The choice of an over-the-hill Vincent Price as Sir Despard is controversial. Some find it an inspired bit of type-casting, while others lament his lack of a passable singing voice. I lean toward the former, but there is admittedly no consensus on the issue. J. Donald Smith notes that "his singing is not bad in the ensemble numbers (and his diction is perfect in the 'Matter' trio) but very weak as a soloist. He obviously needed someone to set the pitch for him." On the other hand, I haven't found anyone who particularly likes Keith Michell in any role whatsoever. 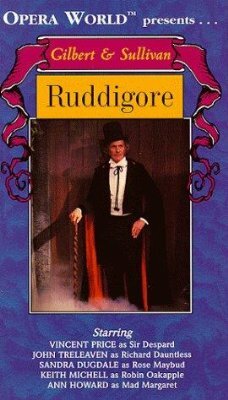 Overall, this is a Ruddigore we're fortunate to have. It will continue to spark debate, but it's a production all should see. The production has numerous cuts, including, "I shipped d'ye see," "The battle's roar is over," "Away, remorse," the second verse of the Madrigal, three out of four verses of "Oh, happy the lily," and the second verse of "There grew a little flower," not to mention incidental dialogue cuts. Even so, it was a tight fit into PBS's two hour slot, as the credits roll during the Act II finale (the only Walker video in which this happens). I understand that "I shipped d'ye see" was included in the version broadcast on the BBC (although not in the home video version), and it is pictured in the Darlene Geis book, The Gilbert and Sullivan Operas, which was issued as a companion to the series. 2002 Acorn Media DVD AMP-5386 Available only in a 10-disc boxed set (cat. AMP-5483) including the entire Brent Walker series, excepting Trial and Cox and Box.